Beautiful weather reflected the bright spirits of 254 graduates as they walked across the stage in ceremonial regalia to shake the hand of Hannibal-LaGrange University President, Dr. Anthony Allen, and receive their diplomas on Saturday, May 5. The commencement address was given by Mr. Glenn Miller, founder and CEO of Miller Management Systems, LLC. Dr. Miller is also a member of the HLGU Board of Trustees and currently serves as board treasurer, executive committee member, and chair of the presidential review committee. 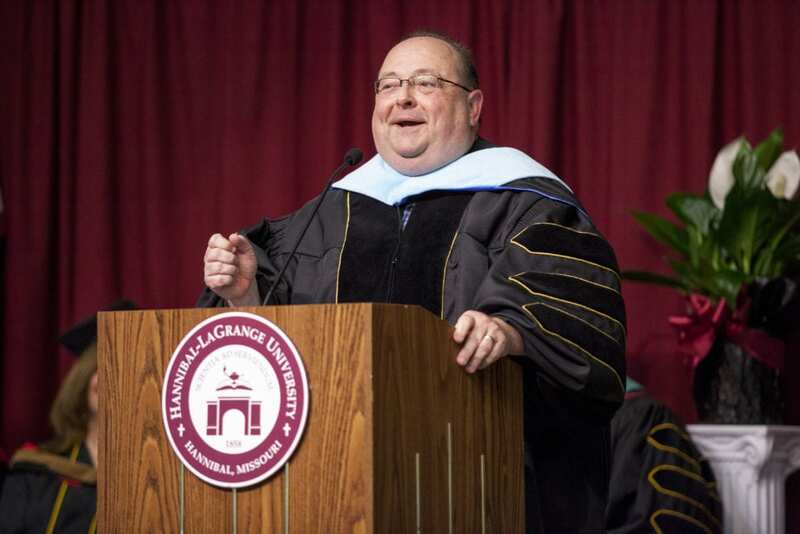 Dr. Miller’s commencement address centered around its title of We Can Do Better, as he encouraged the graduates and those present to be unified in love toward one another, even when disagreeing with each other. “If we want to see the world changed for the better…can I suggest to you that we as Christians should be working together, not apart?” asked Dr. Miller. Following the presentation of graduates, Cassidy Winters and Keith Schmutzler, selected Who’s Who Among Seniors at HLGU, led the graduates in the graduate pledge and in giving a standing ovation to thank all friends and family for their support. Also at commencement, the Parkway Distinguished Professor Award was presented to Dr. Julie Albee. The award is given by Parkway Baptist Church in St. Louis, and selection is based on outstanding professional and personal contributions to Christian education. Dr. Julie Albee was selected by her colleagues for the award. She joined the HLGU faculty in 2003 and serves as a professor of education and director of student learning improvement. Dr. Albee earned a PhD with a specialty in reading/literacy and higher education from the University of Missouri-Kansas City. She also holds a master’s of science degree from Iowa State University, and a bachelor of science from Missouri Western State College. Since 2004 Dr. Albee has led Hannibal-LaGrange University’s efforts to improve student learning. Through her tireless efforts, and always-positive attitude, she has played a leading role in creating a can-do culture of continuous teaching and learning improvement on our campus. Dr. Albee also models lifelong learning and makes contributions to her field through extensive research. She has published numerous articles and often been an invited speaker in the areas of reading and literacy. She actively participates in professional organizations to remain current in her field and has served in consulting roles for area school districts. Dr. Albee exemplifies Christ-like character as a servant-leader, has a heart for people, and is known for her personal and professional integrity. Her husband Mark, serves as pastor of Immanuel Baptist Church in Hannibal. She and Mark have three grown children, Tim, Christina and Ben. In addition, HLGU also honors one staff member each year. The staff member of the year has been awarded since 2010. The selection process includes nominations by fellow staff members with a vote of affirmation by the administration. This year, the award went to Mr. Brian Clark. Brian began working at HLGU in the IT department in October 2016. Since that time few people have made an impact on the mission, culture, and function of HLGU as quickly as Brian. Brian holds a BA from Central Bible College, a Master of Arts in Pastoral Counseling from Liberty Baptist Theological Seminary and is currently working on completing a Master of Theological Studies, also from Liberty. Brian successfully manages implementation of the new campus management software, training and support for that software, and many other IT campus needs, and he does so in a willing and positive manner. Brian is the Associate Pastor at Tabernacle of Praise, here in Hannibal, where he serves in the areas of pastoral counseling and discipleship, the board of elders, and the worship team. Brian and his wife Jennie have been married for 14 years and have four children. Special music during the ceremony was presented by Mr. Ben Kendall, instructor of music, and Mrs. Angela Smith Ferrell ’17. Prior to the ceremony, the graduates processed through the HLGU arch on the University’s traditional Walk of Honor, symbolizing the end of their schooling and their entrance into the world as college graduates.